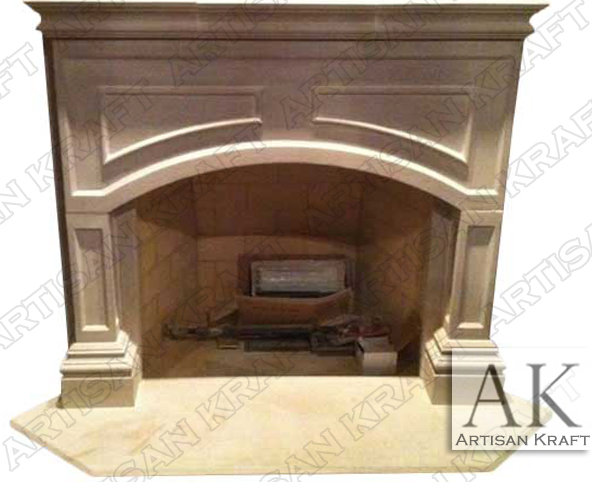 Traditional Lancaster fireplace mantel is pictured here in cast stone. Panels on this design work great in an office or library setting. A contemporary feel and custom shaped hearth. The Lancaster is English by design. In this image it was installed into the corner of a home office or library. This way it adds style and warmth to a room without taking up the wall. Consider having this made from limestone. Typical Dimensions: 62″ wide x 48″ high *can be made to custom dimensions.